Sitting at a red light with your two daughters strapped into their car seats behind you seems like a funny place to be contemplating free will, but I guess it’s as good as any. To our left and right and all around us are other people in other metal boxes, all different colors and unique in features and gadgets and stickers and all the same. Some of these other people find distraction in their phones or their stereos or their own faces in the mirror. Some just sit. Everyone waiting for their turn, waiting for the predetermined amount of time to expire and the little light hanging high above to give us permission to go. It’s the order of things. And how things stay in order. There are a whole lot of us living here, all stacked on top of one another. Without rules this grand human experiment would fall to pieces even faster than it actually is. Our civil society depends on our unquestioned boundaries. A civil society depends on adherence to convention. Embers of chaos are extinguished by conformity and acceptance. We fence ourselves in with a wide gamut of behavior dictating guidelines. Of course there’s the biggies, the basics, the Commandment material – no killing, no stealing, no pillaging – which was enough when our villages were few and separated by at least a donkey ride. But as suburbia metastasized and we stopped throwing our sewage in the streets, the number and complexities of our guidelines had to grow. Our daily lives increasingly dictated to us by the need for order. Take a number. Please hold and the next available operator will be with you shortly. Pedestrians to the left, bikes to the right. Attach your W-2. Follow the velvet rope. Fill out this form and take a seat. Take off your shoes and place them on the conveyor belt to be scanned. Red means stop, green means go. Society has a plan for us. Maybe it’s a plan without a predetermined destination; but it’s a plan nonetheless. We are conscripted into the service of this plan if we are to participate in society. And there are consequences for opting out. I may believe that I live by my own terms, but that wouldn’t be true. The truth is the terms have been handed down to us through generations, through civilization itself, and from that preapproved list I may choose my own path. There are limits. There have to be. If free will – or from a slightly different angle, freedom – wasn’t hemmed in by societal obligations, all that we experience as civilization would crumble. Free will still wouldn’t exist in a vacuum, it would simply be pushed in at the edges by anarchy rather than structure. Hegel talked about civil society functioning through a “system of needs” with each individual relating to each other, and to the whole, in universal terms. What works for one must work for all. If I don’t abide by the rules that protect other’s rights, then my rights are in danger also. 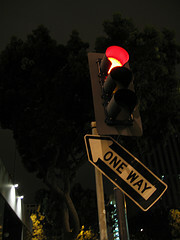 If I don’t obey the big red light that tells me when to stop then I can’t trust that others will either. But here’s the thing. (If I may change into my flowy pants and change metaphysical gears here) those are the rules for only one realm. Those are the rules for our physical bodies operating on this physical plane of existence. While our earthly forms may be bound by the need for such boundaries, freedom – real freedom – has nothing to do with our bodies. Physical freedom is for other animals, not us. We are weak and slow and hairless and flightless and defenseless. What we have evolved into physically absolutely requires order and structure and boundaries because without them we would not survive. Our freedom isn’t rooted in this body or this society – it comes from our mind, our spirit, our energy, our soul. Our freedom is our divinity and our divinity is our freedom. Our energy (or whatever you want to call it – labels mean little, I believe) is eternal and unbound. Our minds can conjure reality out of nothing and write it down for all to see. Our spirits soar unchecked if we only choose to acknowledge and allow them. The trouble is we get those two realities – the societal, physical reality and the divine reality – all mixed up and we begin to confuse one for the other, or even begin to forget about one of them altogether. It’s easy to do. We get so wrapped up in the pressures and the obligations and the red lights on this plane that we forget that we also live (or can) on the other. While sitting at the light I looked into the rear view mirror and saw my girls. At 5 and nearly 4 years old, they know little about this societal realm. They are constantly observing it and observing me as I navigate this world and filtering that through their young minds. They are still so much just pure energy – unchecked, uncluttered and unbridled. And I am their guide on this plane. The enforcer of societal boundaries, foisting that which I have conformed to upon their spirits. Again, it is the order of things. As a parent, it is my job to mold them into members of society, to inform them of the order, rules and regulations, so that they too can participate within the structure. But something about that doesn’t feel right. Must I deny them their divine existence in order to guide them into the fold of society? Would I have to encourage them to forsake the comforts and (relative) security of society in order to help them embrace their divine selves? Does a life in one realm necessarily mean a death in the other? Can they have both? Can’t they have both? The answer, of course, is yes. And no. Yes, they can have both. They can live in both worlds and be both their societal self and their divine self. They come into this world as a ball of vibrating energy and they must learn how to play by society’s rules – share, listen, be patient, tell the truth, line up (as much as I hate that one) and don’t whack other people with stuff. From my observations, it seems that it’s very difficult for balls of pure energy to learn these things. But as parents of these balls of energy, it is our job to teach them. If we allow them to just bounce along without learning the rules of this world, then they will be excluded from it as they grow older, which I don’t think any of us want for our kids. They must first understand where they are here before they can fully explore who they are there. The trick, though, is to teach them to be a positive participant in this physical world without dousing the divine light inside of them. After all, it will be from that light that their true freedom can be expressed when the time comes for them to do so. So, how to do that? How do you help your children to embrace their place in society yet still firmly grasp and cultivate that divine self within them? I’m almost forty and still trying to find this balance within myself, so how do I help them to find theirs? But just as I was about to find the answer to this unanswerable question while sitting there with my daughters, just as I was on the edge of discovering this existential truth for myself and my children, smoothing out some of the wrinkles in our eternal path, the signal changed and the green light told me that it was time to go. Oh well. Maybe I’ll figure it out at the next light. For the record, I had a brief moment today where I truly saw something through a child’s eyes and it was magical. Effortlessly magical. I saw trees blowing in the wind, which can be lovely to watch as a grown up, but for just a moment, I wasn’t thinking about the fact that trees move because of the wind. Rather, I saw the trees as alive. I mean, I know they’re alive,but I saw them as living creatures reaching out over the road, trying to catch a hug, playing games… intentional in their actions. Fleeting, but memorable. Anyfreakinghoo.. that has little if nothing to do with your deep thought for the day. I love your writings. Keep on keeping on, brother. Wow, did I say that? I swear I was completely sober this morning with my tree trip. This idea, I think, could be a “to be continued” for a long time. It’s an interesting topic to write about. LOVE the story of the wind through the trees. Kids are such a great reminder to get the hell out of our adult heads for a while. Thank you for sharing and for reading. That must have been one loonnnnggg traffic light. Very well said Brother Father. Our divine energy is indeed the key to eternal understanding and our perpetual existence; not just in this current physical world, but beyond. Mind, spirit, energy and soul are what are most important. I find it interesting that you have referred to the “light” as giving you pause and the opportunity to consider these thoughts. I am just now home from a Masonic Lodge meeting, where we Masons seek “light” and to be “enlightened” as to ALL of which you so accurately describe. It is surprising to me that you seem to believe, or have read or considered so much of what I have studied in Masonry regarding our own individual spirituality, or energy, or divinity. You are so very well tuned in to what is important to each and every one of us, but especially to those of us who, as parents, seek to show our children what is important. Very well done. Keep on Brother Father. I always look forward to more from you. Yeah, it is that one at 580 and Keene – takes forever. I would love the opportunity to sit and talk with you about these thoughts someday. Interesting. Sam Harris wrote about free will…or the lack of, a couple weeks ago. Always a pleasure visiting your blog. Sam Harris is one interesting dude. I have always enjoyed his writing and his ideas, but I became a much bigger fan recently when I watched a debate involving him and Deepak Chopra (among others). What a brilliant mind. It is a pleasure to know you read it, sir. I love how amid all this spirit you noticed the green light and went with it. Gotta keep moving forward, no? Please keep me updated. I can use all the help I can get. Wow, I stumbled upon your writing by chance–what a treat! As one dad speaking to another, your daughters will have a great guide as they grow into their experience of the spirited life. I look forward to reading more. I have to apologize for my delayed response – I have been a little absent from the Pop of late. Thank you so much for the kind words, sir. I appreciate you taking the time to read and comment and I hope to see you around here again.